The Awesomes is an awesome cartoon series. It comes from the minds of Seth Meyers and Mike Shoemaker. 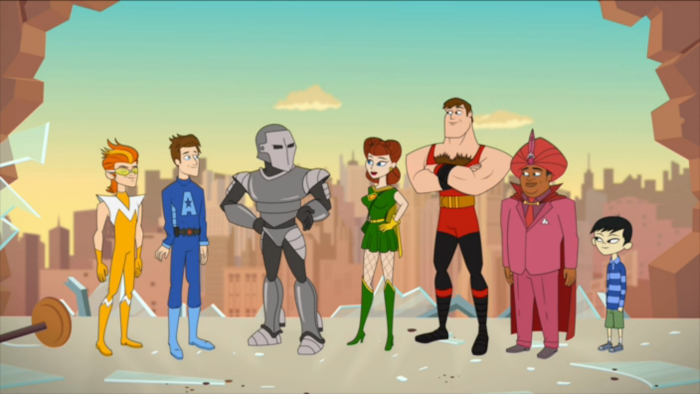 The Awesomes takes place in a world full of colorful superheroes and super villains. It tells the story of a young hero, code named Proc, who is the son of the greatest superhero in the world, Mr. Awesome. Mr. Awesome leads a team of high caliber super-heroes called The Awesomes. After Mr. Awesome retires his team of superheroes disbands. Proc always dreamed of leading a team of superheroes just like his father. So he recruits a team of reject super-heroes to become the new Awesomes. Among the many eccentric characters in the new roster is an 80-year old woman trapped in the body of a 25-year old, an 11-year old boy who can shape shift into a giant sumo wrestler and a conjurer who has attachment issues with his mother. This team of rejects tries to figure out how to work together and believe in themselves enough to save the world. Many SNL alumni lend their vocal talents to these lively personas. Yes, the show is as silly as it sounds. This TV series is absolutely chock full of irreverent humor. Some of the stuff is just so ridiculous I found myself laughing at the sheer absurdity of it. In fact it took me a few minutes when I first started watching the series to get used to their speed and style. The jokes fly fast and furious but once you get used to it you can easily settle in and enjoy all the hi-jinks, potty humor, sexual innuendos and sight gags. I honestly don’t recall a mean spirited joke during the series which was a nice thing to see and very refreshing. There are, however, plenty of spoofs to well known super-heroes and super hero cliques but they are never in your face. They just add another layer. You can have no concept of super heroes and still enjoy the humor. What really makes this series stand out is its heart. At the end of the day these are very flawed people. But they have a good heart and good intentions which allows them to rise up again and again to save the day and try to do the right thing. Does it always happen cleanly? Rarely and that’s the fun of it all. The show is at its best when the heroes are blundering their way to victory. Their incompetence and bickering is just so fun to watch. Even though they mess up and do ridiculous things all the time they’re trying and you can’t help but root for them. It’s a good message for all of us to remember. Nobody is perfect but if you have a good heart and good intentions you can do awesome things. The first season is definitely the best as the team is trying to prove themselves and get in the groove of the whole hero thing. The second season finds them doing bonding activities together through most of the episodes which was hit or miss for me. Fortunately it all leads up to a great season 2 finale and the sequences throughout Season 2 in space are just hysterical. The third season finds the heroes once again as underdogs trying to prove their worth only now they’re a coherent family. It is a riot seeing them taking on a parade of ridiculous villains together as they try to do some good in the world and the finale was great fun with a great message. Although I kind of wanted to see a fourth season at the end of the final disc the series ended on a very good and uplifting note so I was satisfied. I was also happy that the series didn’t wear out its welcome by dragging on. So all in all I would definitely recommend this 3-disc set. It’s a hilarious super-hero spoof to be enjoyed by fans and non-fans of superheroes alike. Plus it’s got a lot of heart. Credits: The Awesomes is property of Hulu, Broadway Video, Sethmaker Shoemeyers Productions, Bento Box Entertainment and Mill Creek Entertainment. We do not own nor claim any rights. To pick up, The Aweseomes, for yourself, click here. Matthew Basile has been dreaming up stories in his head for as long as he can remember. He loved stories of all kinds growing up and has always been enthralled by other worlds. He is thrilled to finally be able to share his own stories with others. Besides storytelling he also loves nature and especially loves combining those two passions. His first novella, Brandon's Fairy Tale, is currently available on Amazon. He is also working on his first comic book called Wolf’s Howl with a Kickstarter coming in October 2018 for it. Matthew currently lives in New Jersey with his two dogs, Molly and Buddy.